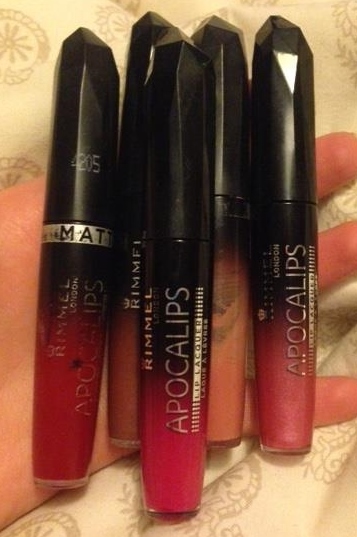 Two more Rimmel Apocalips lipsticks to add to the collection! As I love the Apocalips Lip Lacquer and Matte Lip Velvet so much, I thought I’d share a swatch of my five go-to colours. From left to right (reference the top swatch image), I used ‘Light Year’ (my go-to lacquer), ‘Burning Lava’ (my FAVOURITE red lipstick of all time) and Atomic Rose (matte). The final two swatches are of my two recent lacquer purchases – ‘Out Of This World’ (a shimmery baby pink shade) and finally, ‘Apocaliptic’ (a daring deep pink shade). It’s safe to say I’m a huge fan and with an incredibly affordable price-tag, this product is a great quality alternative to the likes of Lime Crime and other high-end lipstick brands. Have a favourite lipstick brand you’d like to share? Comment in the space below. Please follow my Blog, Instagram and Twitter for more posts like this.